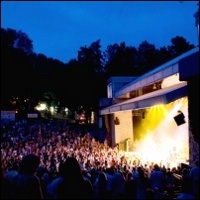 Chastain Park Amphitheater is a small outdoor venue situated comfortably in a natural setting located off Roswell Road in the Buckhead area of Atlanta. Recognized as one of the most popular amphitheaters in the country, Chastain Park Amphitheater sets the standard for summer entertainment in Atlanta. Many of music's biggest names from every musical genre have appeared on the Chastain stage. Chastain is known for its relaxed atmosphere that compliments the performances. Parking: Limited parking is available at Chastain Park Amphitheater for a fee. Follow the signs to the Yelllow, Blue, Red or Green Lots upon arrival to the venue.